Ciara Brown of the Notre Dame-Fairfield glides to the basket for a lay-up against Newtown in a Jan. 18 game in Fairfield. FAIRFIELD — What happens when you mix a fast-tempo, four-guard offense, sprinkle in some senior leadership and add a dash of veteran coaching experience? If you’re the Notre Dame-Fairfield girls basketball team, it results in the perfect recipe for an 11-game winning streak. The Lancers (15-1) have used that formula to position themselves as one of the teams to beat in both the SWC and Class L tournaments as the regular season hits the home stretch. The Lancers’ starting five features only one upperclassman, junior Erin Harris. Sophomores Yamani McCollough and Ciara Brown pair with freshmen Laryssa Guimaraes and Aizhanique Mayo to round out the unit. Off-the-bench freshmen Taylor Gibbs and Kayla Tilus log minutes along with sophomore Krystalee Fernandez. The youth in the lineup helps Notre Dame speed up the tempo on both offense and defense. When the Lancers play at their pace, they feel few opponents can keep up with them. The Lancers average just over 60 points per game and have only been held under 50 once. The guard-heavy lineup creates matchup trouble at both ends of the floor. Notre Dame players realize that when the postseason arrives opponents may try to slow things down and turn it into a half-court game. The closest Notre Dame has come to losing this year — aside from its lone defeat at the hands of New London on Dec. 29 — was an overtime win over Pomperaug on Jan. 11. The Lancers trailed by double digits at halftime but rallied to win in overtime. The veteran leadership of senior captains Vanessa Joseph, Brianna Perez and Mia Dunn helped turn the tide at halftime. “We were clapping it up, telling them we have another 16 minutes,” Dunn said. The Notre Dame seniors were freshmen in 2016 when the Lancers fell to Cromwell in the Class M championship game. They’ve seen just about everything high school basketball can throw at a team. In turn, they’ve brought that experience to the newcomers to the program. “The kids that have been around have memories of past success and past failures that they can share and that’s very valuable,” DeMarco said. 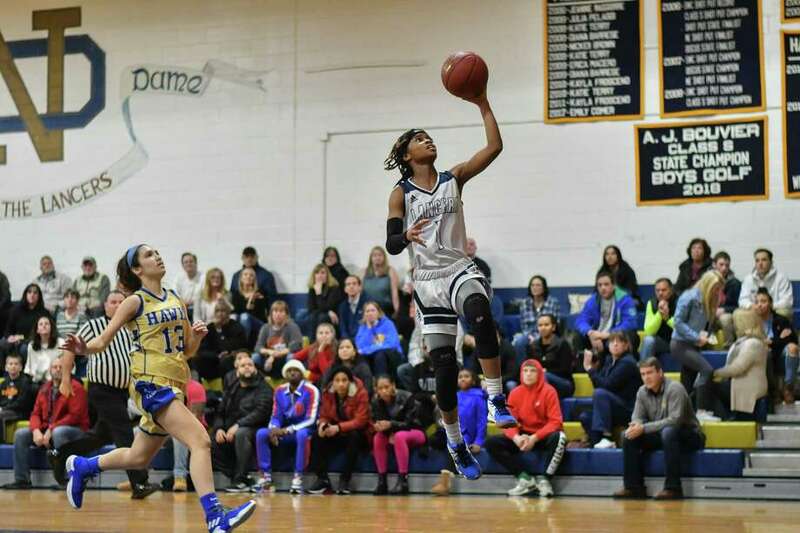 Notre Dame hosts one-loss Kolbe Cathedral on Feb. 6 with the winner taking the inside track as the SWC’s No. 1 playoff seed.